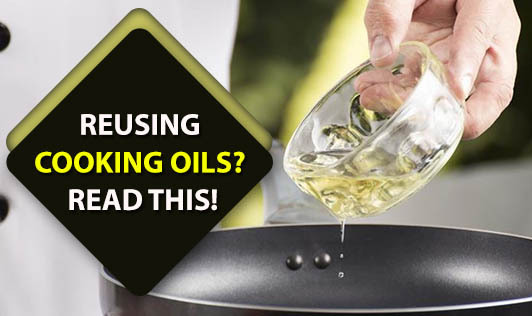 Reusing Cooking Oils? Read This! How many times have you used the same cooking oil over and over again? Each time you deep fry food, you feel guilty about discarding the oil that you just used once. So, you keep it for a couple more days, use it again, and then finally decide to discard it. Is it safe to do so? Is this going to harm you or your family's health? Here is what you should know. When oil is heated to high temperatures while deep frying, it undergoes oxidation and other chemical reactions that make the oil rancid (produce an off-odour and spoil). These reactions also change the composition and property of the oil to the extent of it becoming cancer-causing. If reused oil is not stored properly, bacteria can start growing in it and begin feeding on the left over food particles. Unrefrigerated oils can lead to growth of anaerobic bacteria that can cause food poisoning. It may not sound economical to discard the oil every single time you use it. So, what can you do to reuse oil a couple of times before you discard it? 1. Choose oils with a high smoke point. That is the point at which you begin to see the oil producing smoke or fumes as fatty acids begin to break down. Preferably avoid adding salt to food before frying, as salt lowers the smoke point. 2. While deep frying, shake off excess batter from the food before putting it into the oil. This way, there are lesser particles left in the oil when you decide to reuse it. 3. Strain the oil through a thin cloth to remove minute food particles. 4. Don't mix different types of oil in the same frying pan. 5. Store oil in a cool, dark place. Do not keep it open as light too can change the properties of the oil. 6. Avoid using iron or copper pans while reusing oil, as these can accelerate rancidity. 7. Preferably store oil in a glass container and refrigerate or freeze. This can be used up to a month. With these tips to follow in your kitchen, do make sure your oil is stored well before you think about reusing it.